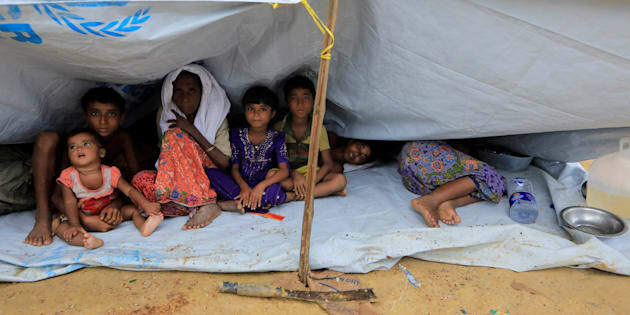 Nearly 590,00 Rohingya refugees have been admitted to camps in Bangladesh and 320,00 refugee children among them are threatened by water-borne diseases and desperate living conditions, a United Nations spokesman said Friday. The Office for the Coordination of Humanitarian Affairs (OCHA) reported that 589,000 Rohingyas have fled Myanmar’s northern Rakhine State since alleged retaliation following a deadly rebel militia attack on 25 August against police posts, said Farhan Haq, the UN spokesman. Just over half of the new arrivals in Bangladesh are staying in Kutupalong Expansion, he said. It was described as a single large site where aid partners are working with authorities to improve road access, infrastructure and basic services. The most vulnerable among the new arrivals are taken by bus from the border to a transit centre, where the UNHCR and its partners provide food, water, medical checks and temporary shelter, Haq said. The UN Children’s Agency (UNICEF) said that desperate living conditions and water-borne diseases are threatening more than 320,000 Rohingya refugee children, he said. A new report by the agency said most of the refugees are living in overcrowded and unsanitary makeshift settlements. A pledging conference for donors next Monday in Geneva was announced earlier this week. Officials said they hope to raise $434 million to aid Rohingya refugees and their hosts, some 11.2 million people in all. So far it is only 26% funded.